Boost Your Mental Toughness For Tennis! Learn Mental Game Strategies Pros Use! Strategies That Have Helped Professional Athletes Win! Are you (or your players) performing up to your ability in competition? And do you bring your best and most confident game to matches? I’m mental game of tennis coach Dr. Patrick Cohn – owner of Sports Psychology for Tournament Tennis Players. 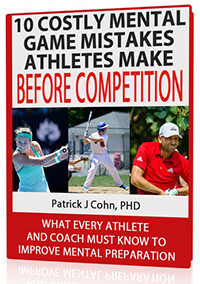 I want to share with you powerful mental strategies to help you perform your best in tournaments – the exact same mental strategies I’ve taught to junior, collegiate, and professional athletes successfully for over 20 years. What’s the key to playing your best tennis? Superior talent? Great coaching? tons of quality practice? Unrelenting determination? All of these are key, but they can only take you so far with your game. After which, you must master the secrets to superior mental toughness! No matter how much you practice, if you suffer from lack of focus, low self-confidence or other mental game obstacles when you play in matches, you can’t reach your true potential in tennis or have fun. I know this game can be frustrating and tear your heart out after all the hard work, lessons, and practice you do. But what really bugs me is that all this suffering is really unnecessary. Having helped my personal coaching students overcome these challenges, you too can discover the top mental game strategies I have taught to Junior, Collegiate, Amateur, and Professional Athletes! Working with some of the top athletes in the world including Junior, Collegiate, and Professional winners on techniques to improve confidence, focus, and composure – for over 20 years. Authoring and producing an extensive library of sports psychology books, videos, audio programs and training seminars. (Visit the PeakSports.com proshop or seminar page for details). Earning a Ph.D. in Sports Psychology from the University of Virginia having published more articles than any other students at the time. Owning and operating the world’s leading mental training website with over 25,000 readers and hundreds of current members who are reaping the rewards mental game coaching brings to their performance. Owner and founder of Sports Psychology for Tennis web site with over 100 articles, podcasts, and videos on the mental game of tennis and thousands of readers. Owner and founder of two online mental training web sites at Peaksports Network and Kids’ Sports Psychology with over 700 pages of tips, articles, podcast, videos, and e-books. I’m on a mission to teach you proven and simple mental game strategies so you can overcome any mental barrier, take your practice game to tournaments, and boost your tennis confidence. I won’t waste your time by boring you with psychobabble or fluff! Just simple. proven mental game strategies to help you perform at your peak! The best part is that you too, can tap into my expertise and experience I’ve amassed about boosting other tennis players mental game – so you can perform your best in tournament play! You’ll learn the top eight mental game lessons for tennis players – the same lessons I teach my personal coaching students, who pay thousands of dollars for my strategies. I’ve made sure that my lessons are easy and effortless for you to improve your mental game (I’m known by many experts in sports psychology for simplifying the mental game for athletes). **While you wait for the CD and workbook to arrive, you can download (from anywhere in the world) all eight mental game sessions from my web site – immediately after your purchase. No waiting for delivery! Start improving your mental toughness today! Digital Download: $50 Off + No Shipping! Perfect for customers who want immediate access to the program with no shipping cost. Avoid costly international shipping charges! CDs and Workbook Shipped To You! We will ship the CDs and Workbook to you. You will also be able to download the program immediately after purchase. Who Should Purchase “Tennis Confidence”? What’s Included In the “Tennis Confidence” Program? “Tennis Confidence” is a complete brain dump of the TOP eight mental training sessions I teach my personal students to help them boost their mental game and improve consistency – from managing unrealistic expectations to coping with perfectionism to building unbeatable confidence. 4 CDs including 8 confidence-boosting sessions on audio. Each 25-30 minute session includes one mental training lesson to help you improve confidence, focus, composure, and develop focused routines (4 CDs value = $400). One “Tennis Confidence” workbook to guide you through my mental toughness sessions and to overcome mental game roadblocks (Workbook value: $89.00). Eight “Tennis Confidence” Post-Match Assessments to help assess how you are doing and provide the answers to make any adjustments with your mental game (Assessments value: $160.00). TOTAL VALUE OF MY “TENNIS CONFIDENCE” PROGRAM = $680 PLUS! BONUS 1: Prematch Tennis Confidence Mental Prep Podcasts – You get eight prematch podcasts to help you review the most important mental strategies for each of the eight mental game sessions. Repetition is also key to learning the mental game (bonus value = $50.00). BONUS 2: Mental Game Question and Answer MP3s – I answer the top 10 questions I’ve received from tennis players about specific mental game challenges that block their success. (bonus value = $30.00). BONUS 3: Prematch Mental Preparation Guide – Learn the top mental game strategies to help you improve your mental preparation for matches. Use my prematch system to help you get your game face on for matches (bonus value = $20.00). BONUS 4: Recorded Mental Coaching Session – I’m committed to helping you succeed with your mental game and performance on the court. Download a mental training session I conducted with “Tennis Confidence” Members! (bonus value = 30.00). Total VALUE of Bonus Package: $225.00! What’s the Cost, Dr. Cohn? “Tennis Confidence” 4-CD and Workbook program is the most comprehensive mental game program I’ve offered to the public. I’m virtually giving away all my mental game secrets for the incredibly low price of only $299.00 including the free bonuses! Not only do we send you the CDs and workbook, but you can download the entire program too. Why so cheap? This is my way of saying “thanks” to my loyal Peaksports.com and Sports Psychology for Tennis subscribers! Of course, I’m happy if you instead choose to enroll in my one-on-one mental coaching program! However, my one-on-one personal coaching program starts at $600 for one month of coaching! Download all eight mental game lessons from my web site to your computer instantly after your purchase – while you wait for your CDs and workbook. Get started right away with your mental game plan! The easiest and most efficient way is to place your order online today. Click Here to Order Now. Call us toll free 888-742-7225 and place your order with a valid credit card. Have your email, address, phone number, and credit card handy. I stand by my work 100%… I never want you to feel like buying the “Tennis Confidence” CD and Workbook program is a gamble. Embrace my strategies and apply it 100% to your game. If you’re not happy, for ANY reason in the next 30 days, just contact us by email or phone, return the CDs and workbook and I will buy it back. You’ll get a courteous refund of every penny! Does that sound fair? Thank you for taking the time to read about the “Tennis Confidence” Audio CD and Workbook Program – the best value to rocket your confidence, focus, and composure to new heights. Please contact me if you have any questions! P.S. You can learn the same confidence-boosting mental game strategies I teach my one-on-one coaching students for a fraction of the price. What would it be worth to you to perform with greater consistency and confidence without practicing more? Click here to order “Tennis Confidence Audio and Workbook Program” – to rocket your game to new heights!